Just figured I'd drop a friendly note here letting you know I've posted a link here from CityCraft as it will be used for that modded server. Is possible to add a "selling" section and made it configurable like the but section? I mean a section to sell configurable item to the market with the same configuration options of the buy section. Thank You for your work on this mod. PS: Ah and a configuration option for the volume af the Salesperson??? I was wondering if there was a way to change the quantities of seeds/saplings sold by the market stall, so that it isn't 1 emerald per single seed. Currently that can only be achieved by disabling the entry from the defaults and adding it as a custom entry (in the MarketRegistry.json). However, that does sound like a useful feature to be added as an option to affect all defaults, so I'll probably make that easier to do in the next update. Curious how the trough works. I had one in my cow pen and one in my sheep pen. Filled with wheat and then went mining. Came back and there were only a few more cows, but like 50 more sheep. I experimented with moving them to the opposite ends of the pens, but clearly the sheep are pulling from the cows trough. Are the troughs just too close? Thanks! Hmm, I haven't really considered this yet. It would probably make sense for the trough to not work across fences for example. It currently has a range of eight blocks by default (can be changed in config file). Was wondering if there was any way to change the skin of the Weathered Salesperson? Also, is there a way to disable the tabs on the market if we aren't selling items under those tabs? The skin can be changed with a resource pack like everything else. It doesn't just pull any player skin, the texture is included in the assets. Why don't the filter buttons work for me? i put the block down for the first time, brilliant! A+ in character. thank you. Intriguing mod, keep them coming. nice job, cant wait for the 1.11.2 release~! first, let me say, that i love your mod and put it in every one of my private packs. But in my newest pack i tried to add more items and had a problem. The prices in the table were mest up. The objects costet themselfes. (for Example, the price for steak was 1x steak). Would also give body parts for a custom market that can be player defined. What does this use for currency and is it configurable? Can it use any item for currency? If not, that would be a request to add. Also, is compatibility with BoP or other mods just something you add in configs or is that something you have to add? 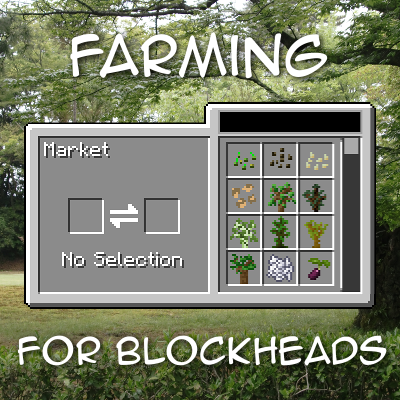 By default it supports Pam's Harvestcraft Seeds & Saplings, paid in emeralds. Both currency as well as items sold can be configured (per-item). Other mods' seeds need to be added the same way, although I'll probably be adding default entries for those as well as they come up. Cool. Your mods are among the best! Keep up the good work!